One of the ambitious dreams that Reclaiming Adoption and its authors share with the Apostle Paul is that when Christians hear the word “adoption,” they will think first about their adoption by God. As it now stands, Christians usually think first about the adoption of children. Reclaiming Adoption sets out to change this situation by providing breathtaking views of God’s love for and delight in His children—views that will free you to live boldly in this world from God’s acceptance, not in order to gain it. Reclaiming Adoption begins by examining Jesus’ Parable of the Prodigal Son because it ultimately puts God the Father’s love on display—a love that embraces the younger son with uninhibited joy (Luke 15:20) and goes out to entreat the self-righteous older son to come join the celebration (Luke 15:28). 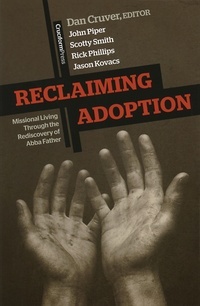 Reclaiming Adoption believes that behind the Parable of the Prodigal Son(s) is Scripture’s teaching on adoption. The story of the Bible is that God the Father sent His only true and eternal Son on a mission, and that mission was to bring many wayward and rebellious sons home to glory (Hebrews 2:10), to adopt them into His family. That is the Story behind the story of the Prodigal Sons. That is the only story that gives our stories any meaning or significance. Dan Cruver and his co-authors, including Jason Kovacs, Richard Phillips, John Piper, and Scotty Smith, are convinced that if Christians learn to first think about their adoption by God, and only then about the adoption of children, they will enjoy deeper communion with the God who is love, and experience greater missional engagement with the pain and suffering of this world. That’s what this book is about. What the orphan, the stranger, and the marginalized in our world need most is churches that are filled with Christians who live daily in the reality of God’s delight in them. Reclaiming Adoption can transform the way you view and live in this world for the glory of God and the good of our world’s most needy.